Unlike other art-forms, dance has been accused of shying away from addressing the ‘big issues’. However, no one can accuse William Forsythe of this. In 2005 he created 'Three Atmospheric Studies', an emotional response to the war in Iraq. His latest work 'I don’t believe in outer space' is billed as “looking at the nature of our existence”. Issues don't get much bigger. Forsythe is best known for his distortion of the classical form. He was one of the first choreographers to invert the lines and constructs of classicism, creating a new way of using and looking at the body. The trademark contorted aesthetic and use of classical vocabulary in a contemporary style inspired a whole generation of choreographers. 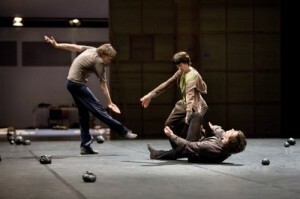 Since forming his own company in 2005 he has continued to look at new ways of making dance. Not content with generating a new choreographic style, Forsythe has more recently turned his attention to tacking sociological, political and philosophical issues often ignored by his neo-classical contemporaries. Forsythe’s choreographic genius lies in his ability to generate exciting and different movement whilst working with current topics or clearly defined concepts. His contortion of the body and compelling subject matters often create a distorted and powerful representation of humanity. He talks of being interested in the nature of indeterminacy…. a quality very apparent throughout his history. Forsythe’s constant striving for something new means that we never know quite what to expect from each new work. His company is home to some truly astonishing dancers. 'I don’t believe in outer space' features a soundtrack by long-term collaborator Thom Willems, and if the promotional videos are anything to go by we can definitely expect some simulated ping pong and a performance that excites and challenges. I don't believe in outer space by The Forsythe Company is at Sadler's Wells on 22-23 February, 7.30pm. Tickets £10-27.